"You heard a loud 'boom', and it was the vibration alone that made me think the engine had failed," he said. Mr Rehmar said that for a few moments, he thought "we were going to go down." His worry that the aircraft's wing could have been compromised disappeared when the flight stabilised within 30 seconds. And he added that the pilots had quickly shut down the affected engine. 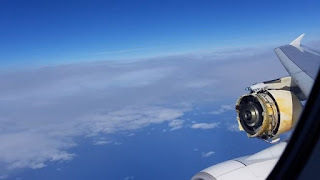 Photos taken by passengers showed the cowling, or engine covering, completely destroyed, and some cosmetic damage to the wing's surface.